The good news is that the growth of Community Supported Agriculture is real. And with real growth comes real opportunity for real issues. I had the unfortunate opportunity to show a mom that her “local basket” contained items grown not only out of the state but out of the country. I’m encouraged by all of the wordpress bloggers who are exploring CSA membership. Often times the questions are tentative; will I be able to do this? Some time back I talked about the reasons to belong to a CSA. Here are some useful tips that share not only the good, but the real. Plan a week’s worth of menus when your CSA arrives and create a grocery list at the same time. That way you won’t get stuck with things that you don’t know what to do with and you’ll have everything on hand to prepare your meal. Realize that there will be new items that you are not familiar with or that aren’t your favorites. Look at those items as a challenge. Try different recipes and keep track of what works and what doesn’t. Consider upgrading your blender. I went for a long time with my old one but have to admit that my Vitamix gets daily use. I make green smoothies in the morning and it’s a healthy way to use greens, carrots, cucumbers, fruit, or whatever you like. Start out with half a share. I didn’t do this but I have a family of five. If I didn’t, I’d likely struggle to use it all. Half a share is a good way to put your toe in the water. Learn to make good vegetable stock. Our CSA arrives on Thursday so there are many times that I’m going through the fridge on Wednesday evening to see what might go into the stock pot. Keep the tops and peels from the whole week and use those too and keep track of your favorite combinations. Think about using a dehydrator. I was fortunate in that my grandmother had one that I confiscated but it has been really useful. I love to use it for leeks and okra that I can add to soups all year long but I’ve also found some great raw recipes. Invest in a friendship. The other night our printer wasn’t working and my boys needed it in order to finish their homework. I sent them to a neighbors house with a bouquet of fresh beets. You can always find someone who’ll enjoy what you can’t use. Scour Craig’s list for a juicer. I found a wonderful, never used Green Star and told my husband to buy for me for Christmas. It’s a fun, healthy way to use fruits and vegetables. We even dehydrated the pulp into crackers. Forgive yourself and put it in the compost. This isn’t my favorite option but it has happened. As long as I’m enriching the soil, I feel better about it. Talk to your farmer and the other CSA participants and find out what’s working for them. Swap ideas and recipes and vegetables. After all, this is Community Supported Agriculture. Wonderful suggestions, Tammy! The hardest part of starting the CSA was working backwards in menu planning–looking at what came in the box and then choosing the recipes. It gets easier with time, though, and now it is a fun challenge! Then there is the part where I was composting what we didn’t consume, because, honestly, I just didn’t know what to make with it. Again, through trial and error, I found uses for the produce I never cooked with before and now has become a favorite in our meals. Your carrots are beautiful! We love the multi-colored carrots. They are sweet and crunchy and so pretty. Thanks Lisa. It does take time and perhaps I should have listed that as a tip. Thanks for listing ways to use up the unused items; that’s always a struggle. I definitely need to make veggie stock more often. I’m also glad you added number 9. It’s the skeleton in the closet of all CSA shareholders. There’s no point in carrying around compost guilt. It’s better that we support our local farmers even if it means we don’t always use everything. I’m glad you agree. I even felt a bit guilty writing it. How do you join a CSA? One of the best ways to locate one is through localharvest.org. I’ve tried a couple of different ones and been with the one that we use for several years now. Great post! I actually split 1/2 share with my neighbors – I live alone and even half a share seemed like a lot. I have been wanting a VitaMix – gonna try my neighbors for a bit to see if I really like it as much as I think I will. I love my juicer but feel very guilty just composting the ‘pulp’ (ie, FOOD!). I don’t bake and I know I ***should*** make soup stock but I haven’t. Maybe that’s my next growth step! I don’t bake either Diane and don’t beat yourself up. We all start where we start. Soup stock is a next step. For a week, save the tops and peelings. as always, great suggestions! as a single, i’ve considered a half share – and maybe sharing my half share with a friend. toe in the water, gentle start. Sharing a half share is perfect. Lately I’ve been trying carrots with whatever fruits I can get like banana , apples, strawberries but it’s time to tough up and broaden the greens…Thank you for sharing such vital information. Every list is a gem…such an inspiration. Thanks island man! hope you enjoy the lists. All great tips. I’m planning a post on this topic myself as summer gets closer. I feel like the topic is a lot more prevalent than it was when I started and it would have been nice to know these things from the beginning. That was one of my inspirations for beginning a blog – there was no information and now there is! They were not bad – probably not appealing to a wider universe but we at them and one of my kids loved them. I haven’t heard this idea before, but I like the sound of it. Some tips, like planning a week’s menus, are useful even if you’re not part of a CSA. I agree. I started the weekly planning routine long before I started CSA. Amazing encouragement, Tammy. Thank you for helping us to take steps. . .even baby ones, in the right direction! Interesting about your friends “non-local” basket. One of my CSA farmers was complaining about this recently. His argument–if someone wants to do something like pull together good organic food from diverse sources, there may be a reason to do that, but it isn’t a CSA, so don’t call it that. I am in a buying club that supplements my CSA produce in summer (with things like avocados and peaches that don’t grow here) and in winter helps me stretch my stored food. I agree too. Call it what it is. Our farm just began allowing us to buy meat, bread and a few other items from local sources. This week I’m trying it out for the first time. Inger, we have the same problem here in Cleveland. There is a buying group that takes a little of everything from all over Ohio, and call’s themselves a CSA. It’s troublesome for us, the true urban farmers, because people say “I’m already in a CSA, and I get a lot more with them.” Not really far to compare apples to oranges. I’ll pass that along. Personally I like to be as directly connected to my producers as possible. When we get huge bunches of greens, I chop them up and saute with garlic and olive oil (after washing, of course). Then I package them in 2 cup portions and freeze to add to soups and casseroles . . . or just to mix into brown rice, quinoi, or barley. That’s a great tip Nancy. I guess I’ve never frozen greens before. I don’t think they would freeze well uncooked . . . but after cooking, they freeze beautifully. When I make a pot of soup, I just drop a huge “ice cube” of greens into the mix. For casseroles, I defrost first. Awesome tip! I often blanch* my greens and then freeze them. Blanching keeps the greens from turning brown and keeps the flavor a bit longer. I have been known, though, when time has been short, to just put leaves in ziplock bags, remove the air, and freeze. *Blanching is when you bring a pot of water to boil, place your greens in for about 30 seconds, pull out and immediately put in a bowl of ice water to quickly stop them from cooking. Remove and pat dry before freezing or cooking. I may end up freezing some greens this week. Solid, practical tips as usual, Tammy. It’s a bit late for this: but do CSAs exist in the UK? I’d be very interested in joining one. Wonderful article and great tips! Can hardly wait a few more months for my shares to begin. Pulp crackers and freezing sautéed greens for later- brilliant. Make sure to do a few posts when it does come in. I learn so much from others who are CSA participants. A great post, nice and practical. You make it sound much more approachable, and as you say if the worst comes to the worst there is always compost to make ! Yes, I think that tip is resonating with many because it removes the guilt. Very good suggestions. I love my dehydrator as well as the blender. My husband just bought me a grinder. What is the curious plant photo above?? 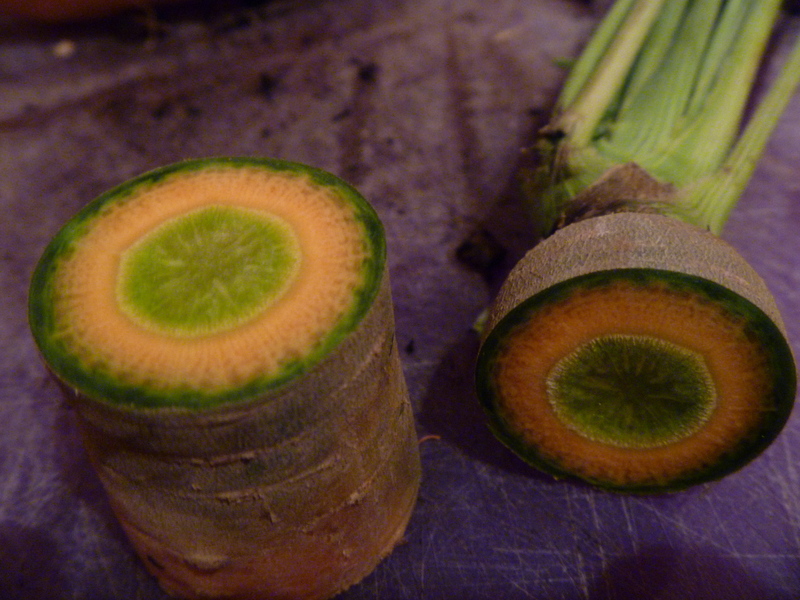 That, my friend, is an heirloom carrot. Gorgeous, isn’t it? This is great! Thanks. FWIW, for us, switching to a mini share was really ideal. We got to continue supporting our farm, but can manage the smaller share much more easily. So glad that worked for you. I can’t imagine getting all of this food if we were just a couple. Awesome tips, do you have any experience with canning? I am planning to start this summer. Thanks! I learned when I was in 4H but that’s a while ago and I haven’t done it. If I was going to start I’d check out some blogs and call my local Extension office. Thanks Paula! I’m not very good at these but I’ll see what I can do. Great suggestions, and I say be adventurous. My CSA – or rather MysteryBox always contains something new, so its been a great way to explore new flavors. What a great site LouAnn! Thank you. This is a great resource for me and everyone. High five for carrots in Vitamix smoothies! 🙂 I keep watching out/waiting for a CSA to become available in Canberra. I really, really hope it does one day, I love the idea and the freshness and the out-of-one’s-comfort zone aspects of the CSA! you would love it Hannah and how bout saving up for a dehydrator? I think you’d love that too. maybe you can start one Tandy? Where we live, there isn’t such a thing either. I think this is a great way to be creative with your foods & how to come up with tasty recipes & inventions to use seasonal produce! I tried to look for you but there are so many cities here in the US named Belgium that I kept finding those. Oh well. Vitamix! Have to get me one of those! Thank you for the great tips, Tammy. I am a CSA newbie and was scratching my head at how to use up the different greens that were delivered the last two times. Last night, I made a a large pot of soup using a combination of greens and used up a whole bunch of them. The soup I made yesterday was a combination of potato, fennel, kale and swiss chard simmered in stock with sauteed onions and garlic. It used up a bunch of greens I had lying around from my CSA delivery and spared me the effort of cooking them separately. I might try adding collard greens next time. Collard greens are very mild and I like them with a banana, carrots and other fruit in the blender. We don’t have this either, but we have local organic farmers where we could go and buy their products, and one farmer sells his eggs and root vegetables in a local shop, too. Still, I usually end up buying everything in the supermarket where I always go (or, a little grocery as in our little town there are no real supermarkets.. :D). I’d love a Vitamix but here in Finland, at least, they’re too expensive for me to afford. My own way cheaper blender has been good enough, and I love to start my days with a smoothie too. And I’ve started the habit of weekly menus, not too strict menus though 😉 I put up some 13 weeks of menus last autumn, and during Christmas I got a break from that, but now I’ve realized it’s so handy having these lists, helps buying food and making a bit different kinds of meals! Yes, I love menu planning with or without a CSA. And I went for a long time before I invested in a Vitamix! This CSA season I hope to be better about washing and drying everything as soon as I get home, and maybe that will help cut down a bit on spoilage. Your notes about composting hit home. I’ll try not to feel so guilty when I have to…even if it doesn’t happen often, I do really regret it. We don’t have an organisation like the CSA here in Australia but I think it’s a fantastic idea. We should all be doing what we can to buy locally grown produce and walking straight on by all the cheap imports. This is vital for the future of our farming industries and our ability to feed our nation. Great post – I hope it results in a lot of people joining the cause. great tips. I also upgraded to a vita mix and it is worth every penny. making homemade stock is a perfect way to use of bits and ends and provide much need comfort in the winter months for soups. Thanks Vianney and if other readers haven’t checked out your blog, they should do so! http://sweetlifebake.com/#axzz1oUyqCgFs is an awesome site and is quickly gaining national traction! I absolutely love my CSA. It can be a bit expensive upfront, but I have found if you just talk to people, they are usually pretty nice about letting you make payments. Food is not being wasted in my house and I have found a great community for swapping recipes and ideas about storage. It is expensive but when I juxtaposed it against the rest of our food bill and was determined to have a healthy menu, it was well worth it. It’s my starting point. Viva CSAs! It’s a great way to support local ag. We were very happy using Love Grows out in Mesa because they were organic, but recently found another option closer to home that we decided to test. Agreed: the dehydrator and VitaMix are great tools! We do smoothies for most breakfasts and soups for or with most dinners. Broth is a no-brainer; why use water when you can use flavor and nutrition! I’ve seen CSA farms partner with one another, but haven’t encountered out of state or foreign foods in CSA bags before. I’m sure it’s possible, but then what has happened to the “C” in CSA? An occasional unscrupulous farmer may be defining “community” in extremely broad terms. The C in CSA is the most important element and what we need to fight to preserve. I wonder if there is something as such in India. But I do plan my meal according to what is fresh and local in here. For example, spinach, green onions, mint and coriander is locally grown here and it comes in the Friday market. So saturday is our Spinach day. I do my bit this way… Don’t know abt any organization though. I’ll try to find out. I was stunned to find out that “local” meant within 400 miles – or a day’s drive. I hadn’t given much thought to what “local” meant but after our food co-op rep explained the “day’s drive” concept, I understood. Of course you can always create your own definition. In a perfect world, it’d be more like 100 miles. Things aren’t perfect. Absolutely fantastic suggestions! We have been getting a CSA box for about 5 years and we adore it. I really appreciate all these ideas, though–many are ones I hadn’t thought of but plan to employ! Tammy, freezing greens is one of those skills I consider necessary to being kitche literate (but I’ve always lived somewhere with serious winter!) Freezing and throwing supper parties were always my keys to using everything up promptly. Once I lived alone, I did find a CSA designed for four to really be too much to deal with, and splitting was a bit of a pain (I split for two years). Switching to a market share, where you pre-buy farmer’s market $$ worked best for me. It also allowed me to complement what I grew in the garden easily, instead of discovering that my peak chard overlapped with the CSA peak chard! I had a leftovers night tonight and wiped out a bunch of stuff. Greens are so easy for me to use up that I never have enough to freeze. Lettuce however, is harder. I still have lettuce left over from last week and received 2 more heads today in our CSA delivery. Last week’s still fresh and I plan to give it to a neighbor but I am stumped about ways to enjoy lettuce other than in a salad. I know there are some ways to braise it that I haven’t tried. I think using it as a wrap is the other best use. Yeah, I’ve always struggled with lettuce– I’m more a cooked vegetables person, so having 4 or 5 salads a week to eat of CSA lettuce was never something I looked forward to. I do have a couple recipes for lettuce soup, and apparently the crunchy varieties are good in stir-fries… My mother just has a rabbit who will eat all the extras! I saw a lettuce soup but am pretty sure I’d be the only one eating it. Still loving the concept of lettuce wraps. I prefer to use lettuce leaves as wraps but soups are another option now. I decided to experiment this weekend and added a bunch of romaine lettuce leaves to a potato-kale-turnip greens soup. I even added some cabbage. The soup still tasted good and lettuce that would have otherwise gone to waste was used up. Once cooked, I blended the soup using a hand blender so the lettuce and cabbage were undetectable. Served the soup warm with a dollop of crème fraiche and a chunk of whole wheat bread. It got the thumbs up from hubby and the kids. Sounds like you’ve got it figured out! I do have two heads of lettuce in the fridge right now and a delivery comes tomorrow. I’m guessing it will have lettuce also. Try lettuce in your juicer with other veggies &/ or fruit. Great tips! I never think about making stock…will certainly have to do that. I also use up lettuce in the juicer sometimes…with apples and lemons and greens for a “lighter” green drink. Great stuff here – glad to have found you! Glad you did too. Lettuce with apples and lemons sounds yummy. With only 2 in my household, I order my local farm-fresh goods from our Fresh Harvest Co-op.It works a little differently than a CSA. Drawing from a group of trusted farms, they send out an email every Sunday evening, with a line-up of veggies, fruits, herbs, eggs, meats, poultry, etc that are available that week. You pick what you want, and in what quantity, for Wednesday pick up. You personalize your order and get exactly what you want, the week you want it. This has worked well for many small households. I wonder if there are similar co-ops in your (or others) area. We used to have a fabulous coop that closed. What I do know of now is a couple of guys who started Chow Locally. You can see it at chowlocally.com . I think they’ve done what you’re talking about and it looks great. I might work with them for a couple of things that I’m not getting from our farm. I’m making a pot of stock tonight. Watermelon, cuke, mint sounds perfect! Good info. since I JUST joined. A great list on why to invest in a CSA. Most CSA’s send you a box of what is in season in their garden but now some farmer’s are allowing more freedom in your choice. My CSA, Morning Harvest Farms, is unique in that we pre-purchase $400 worth of food credit that we use however we want. Their site has a weekly order form in which we order our meat, groceries and eggs which they then deliver to our home, the farmer’s market or we can go pick up at the farm! You can check out Morning Harvest Farms at http://www.morningharvestfarm.com. Thanks for your comment on my post the other day! I reblogged this post to mine if you don’t mind! If you do then I will remove it! Great job! Hi Tammy – great post! Love the tips, got a few ideas that will come in handy this season for our CSA. We’re going to try green smoothies in the morning! Great suggestion. These are absolutely fantastic tips! I’m going to share your link with a friend who’s interested in joining a CSA. We have been going back and forth for a while now about buying a Vitamix or a Blendtec. I guess we’re going to have to make that decision soon since my pain-in-the-behind department store blender never gets the job done. You won’t believe the difference. I know people who are equally satisfied with both Blendtec and Vitamix. Glad i found you here, my instincts seemed to be right and you reinforced some of my concerns that I might become overwhelmed by a full, weekly share. I went with a full, bi-weekly share because i really wanted to get the hang of things. I will start looking at dehydrating some of the leftovers. I already have my son hooked on soup, so making the stock won’t be new to him. Thanks so much! I’m glad this was helpful. It seems that many people struggle in the beginning and if I had known where to turn it would’ve been easier for me. This is wonderful! I’m glad you are encouraging the CSA model. I think it’s great, (and I should considering I started an urban CSA this year!) I’m going to re-blog this to share with my potential future customers. Thank you very much and good luck with the urban CSA. if you do start one, you should chronicle the progress on a blog. I know for me, participating in the CSA has greatly improved my skills at meal planning, and honestly I have become a better, and more adventurous cook. I feel like keeping the blog of what I have made with my share lets me look back at what I have made and reflect on the progress I have made. Also, I know it’s kind of trendy, but Pinterest has been an invaluable resource for me in meal planning. It’s so easy to search for unusual ingredients and see what other people have made with them. Also, creating a pinboard of recipe ideas by season helps keep me organized and always inspired! Thanks again for the thoughtful advice!